Thanksgiving is this week. I’m so excited to share some great and easy culinary ideas for the occasion! For non-cooks like me, entertaining during the holidays doesn’t have to be stressful. 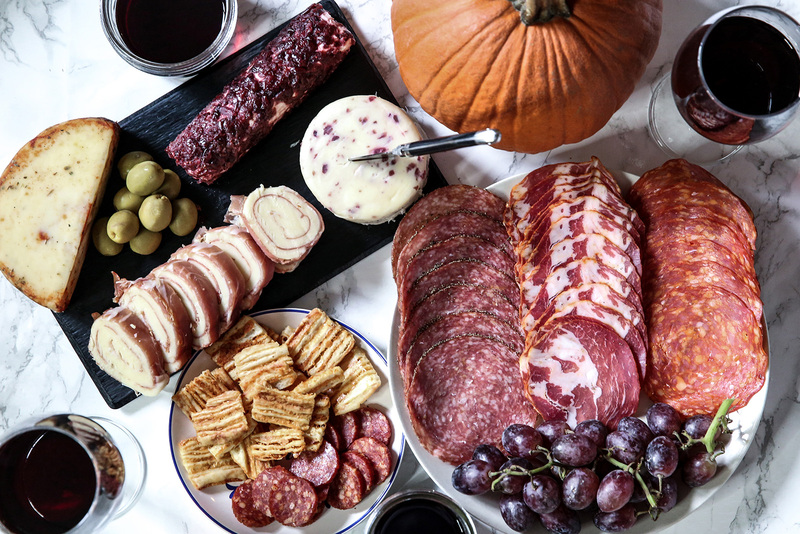 I love putting together a charcuterie spread, get the wine and pick the perfect sweets! For the chefs out there, I have some great recipes by chef I’ve recently met, Carla Hall (you may have seen her on Bravo’s Top Chef and currently hosting ABC’s The Chew). Today, I am partnering with ALDI to bring you so yummy plates that won’t burn a hole in your wallet. Everything is much more affordable than most national brands, which is a perfect because that means extra $$$ to shop Black Friday afterwards. The reason they can do this is due to bulk buying and exclusive brands and sources. 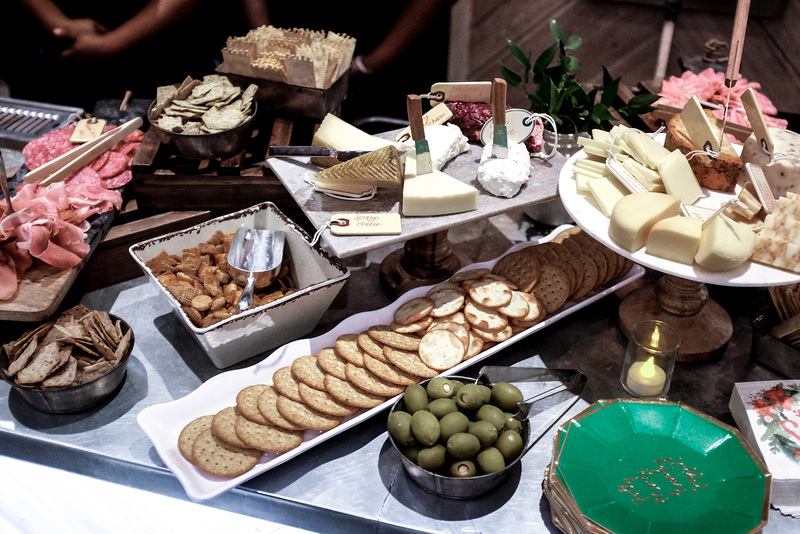 What’s a party without a nice spread of gourmet cheeses and cured meats. Add wine into the mix and you have yourselves a good time before the main event. This my favorite way to add an element of sophistication to the fete. Everything here is from ALDI, including the wines. Personally, I love to have a good cheese, meat and fruit/veggie combo. I usually add crackers or a baguette to go with everything. My favorite selects this time has to be the seasonal cranberry cheeses. I can’t decide whether I loved the cranberry goat cheese or cheddar more. I also added this pepperoni marinara soft cheese to the mix and it tastes just like pizza. 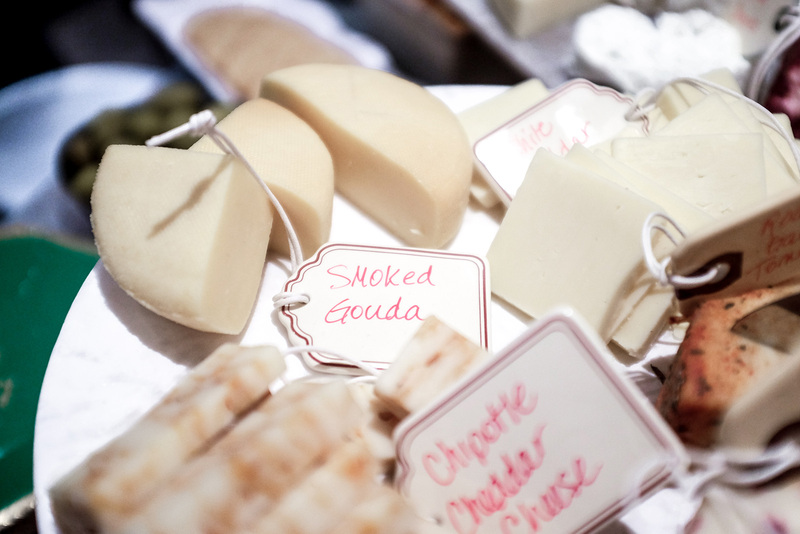 Cheese of different tastes (sweet, savory, umami etc) is always a good call to go with spicy and/or salty cured meats. I’ve been loving the spicy salami, here. Yum! 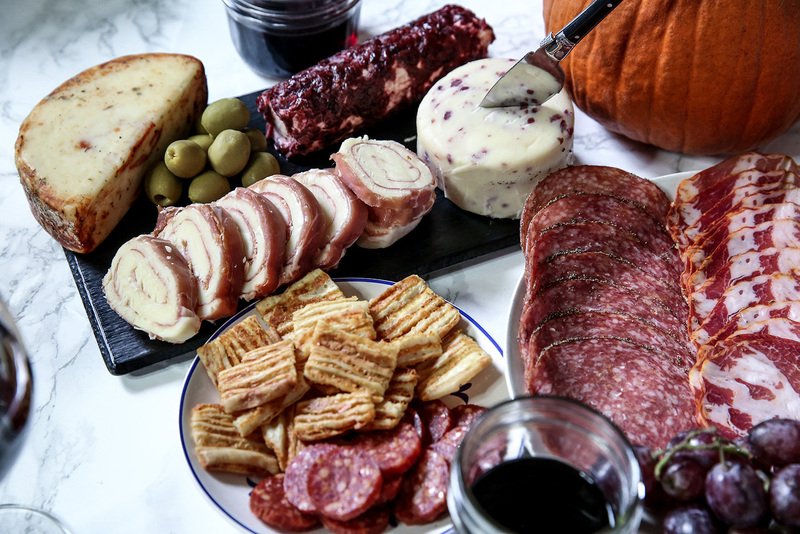 My at-home charcuterie setup from a recent ALDI run. 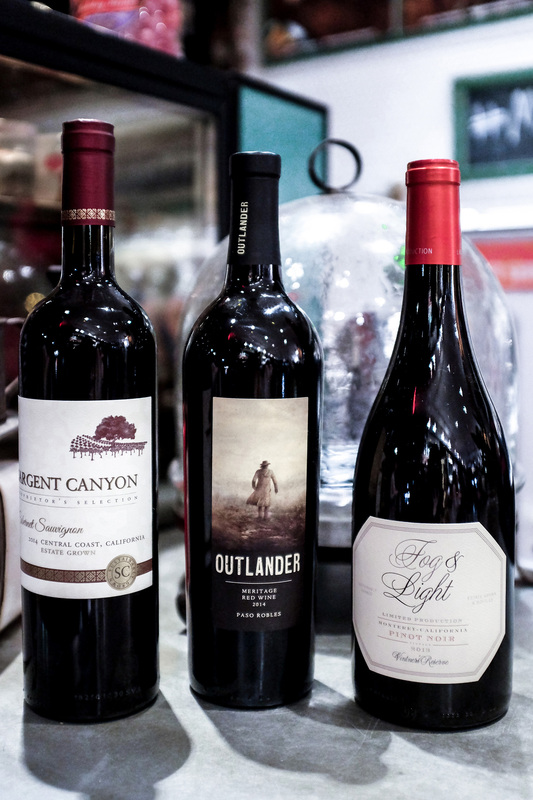 I love the Outlander Meritage red wine. Larger setup idea from ALDI event I attended. So much good gourmet cheese! 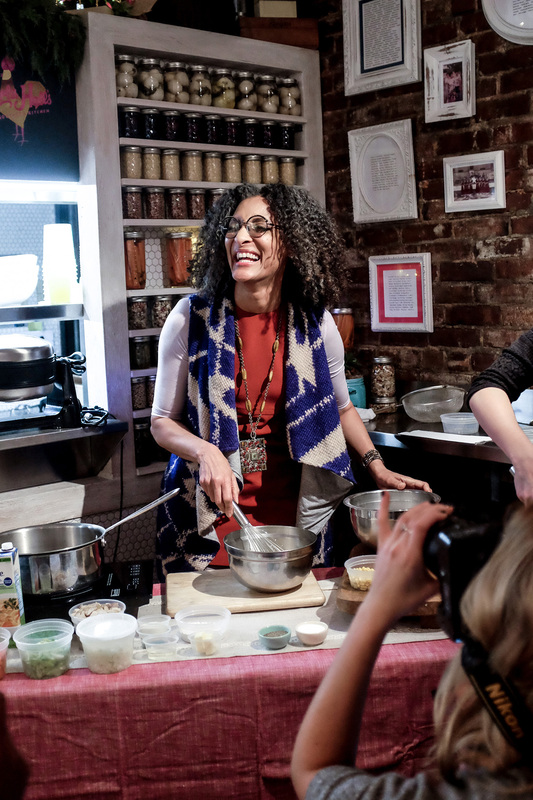 ALDI invited me to a dinner party with Carla Hall, where I got to taste what ALDI offered. It was then that I was so impressed at the quality of many of the snacks and pre-made treats. 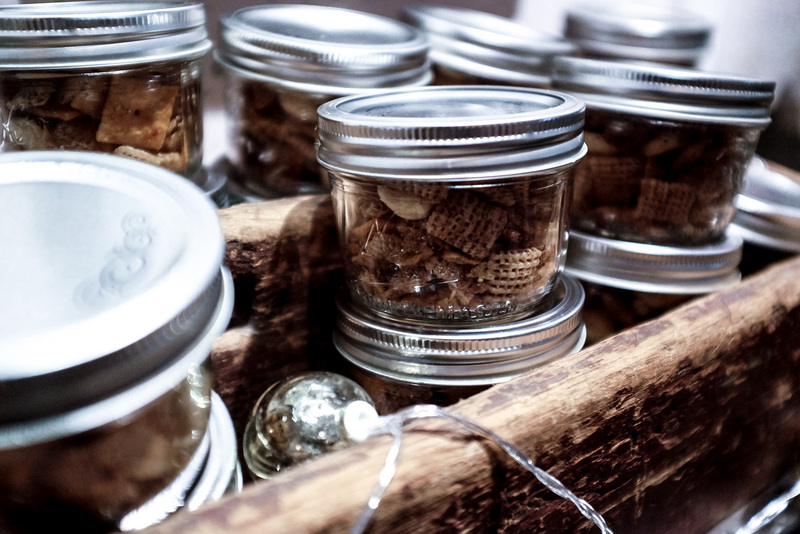 One of my favorites is the trail mix in a mason jar. Not only was it yummy but it makes for such a cute takeaway idea for guests! 2. In a large bowl combine the melted butter with the spices. Add the oyster crackers and toss well to coat. Add in the cheese crackers and rice cereal. Gently toss to coat. 3. Prepare two baking sheets with parchment paper. Divide the cracker mix between the two baking sheets, Bake for 5 minutes, toss the crackers and rotate the baking sheets. Bake for 5 more minutes or until the crackers are slightly golden. Remove from the oven and cool completely. 4. Store in an airtight container. Present in jars for a festive presentations or give as gifts. After a scrumptious meal, a delicious sweet is the next best thing. Shopping at ALDI, I found so many pre-made desserts like these cheesecakes in four different flavors. Other items I spied, were pumpkin and pecan pies. They made it way too easy to make holiday feasts complete without hours in the kitchen or buckets of cash. All you have to do is plate it well, and its a party. 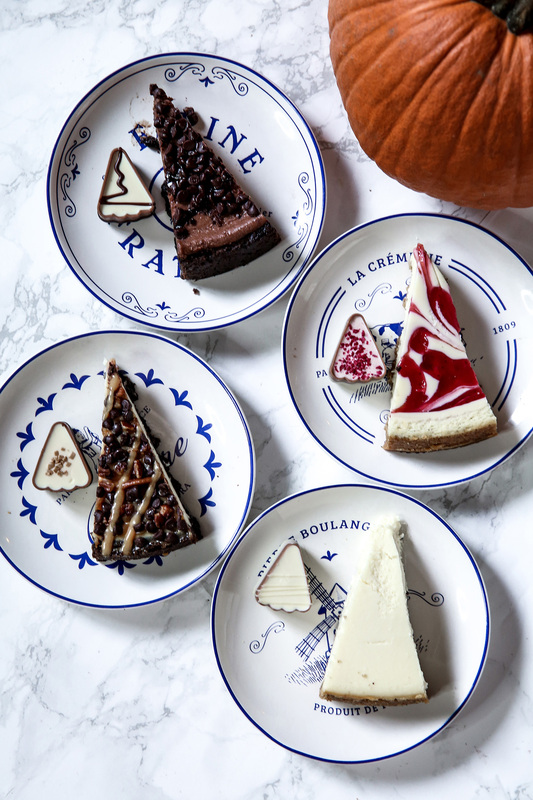 I also found these mini Belgian chocolates in similar cheesecake flavors and paired them together on the plate. So cute! For all the cooks in the family (and those in-training) I have two amazing recipes by Carla Hall for ALDI for you! The first one is my favorites of the dinner I had with her, which she also demonstrated for us before we feasted. 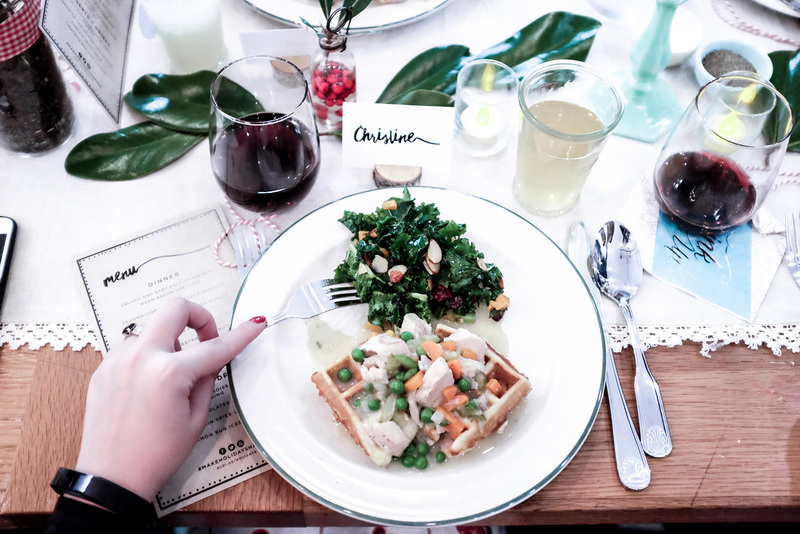 This chicken pot pie over corn waffles was serious comfort food goodness. 1. In an extra-large Dutch oven or stockpot, heat oil over medium heat. Add the onions, carrots, celery and parsley. Season to taste with salt and pepper. Cook, stirring occasionally until just tender, about 15 mins. Add the chicken broth and bring it to boil. 2. Add all the chicken pieces, return to a boil, then lower heat to maintain a bare simmer. Cover and cook until the chicken is just cooked through, about 30 minutes. Remove chicken, transfer to a large platter to cool. 3. Strain the stock through a sieve, reserve the vegetables and keep the stock hot. 4. When the chicken is cool enough to handle, remove and discard the skin and bones and pull the meat into bite size pieces. 5. In a large saucepan, over medium low heat, melt butter. Which in the flour until smooth Which in the hot stock and bring to a boil, stirring occasionally. Continue cooking until the sauce has the consistency of heavy cream, then stir in the heavy cream. Bring to a boil again, then str in the chicken pieces and vegetables until well coated and heated through. Stir in the peas. Season to taste with salt and pepper. Serve filling over corn waffles. 1. Heat a waffle iron to medium. 2. Into a large bowl, sift the flour, sugar, baking powder and salt. In a medium bowl, whisk together the milk and egg yolks. Stir in the sweet corn, then pour the liquid mixture into the four mixture. 3. Store with a spatula until just combines, then stir in the melted butter. The batter will be a little lumpy. In a clean large bowl, heath the egg whites until soft peaks form. Gently fold half of the whites into the batter, then fold in the remaining whites until just incorporated. 4. Lightly grease waffle iron if need. Ladle a spoonful of batter into waffle iron, close and cook the waffle unit golden brown, crisp and cooked through. Check you manufacturer’s instructions for details on the quantity of batter and cook time. 5. Serve immediately with Chicken Pot Pie filling on top. 2. 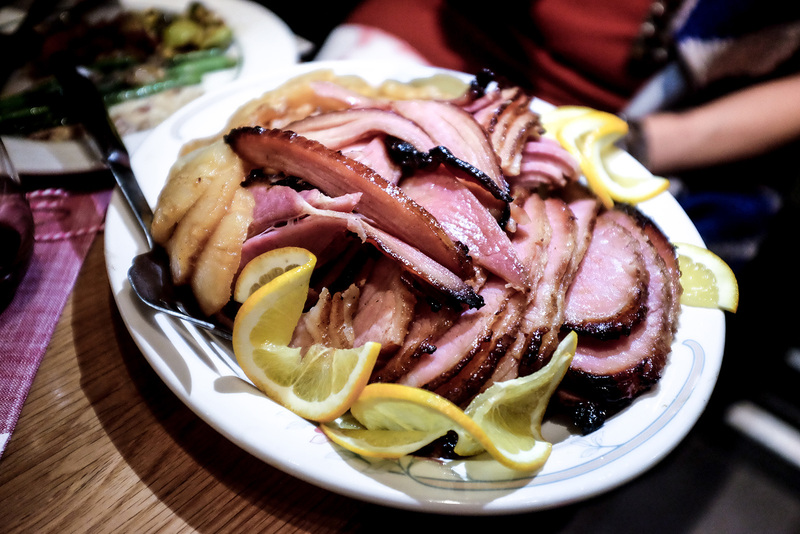 Place the ham, cut side down, in a 9″x13″ glass or ceramic baking dish. 3. Place the remaining ingredients in a small saucepan. Bring to a boil over medium-high heat. Reduce the heat to maintain a steady boil and cook, whisking occasionally, until syrupy and reduced to a 1/2 cup. 4. Pour the hot glaze with all the spices all over the ham. Bake, basting every 10 minutes, until heated through and well-glazed, 35 to 40 minutes. 5. Transfer the ham to a serving platter. Strain the pan sauces through a sieve into a serving vessel. Pass the pan sauce with the ham.